My friends over at Greenpeace recently published an interesting report entitled “How dirty is your data? For those who think that cloud computing is an environmentally friendly business, let’s just say… it’s not without its problems. Data centres to house the explosion of virtual information currently consume 1.5-2% of all global electricity; this is growing at a rate of 12% a year. The IT industry points to cloud computing as the new, green model for our IT infrastructure needs, but few companies provide data that would allow us to objectively evaluate these claims. The technologies of the 21st century are still largely powered by the dirty coal power of the past, with over half of the companies rated herein relying on coal for between 50% and 80% of their energy needs. The 12% growth rate is astounding. It essentially makes it the fastest growing segment in the energy business – so the choices these companies make around how they power their server farms will dictate what the energy industry invests in. If they are content with coal – we’ll burn more coal. If they demand renewables, we’ll end up investing in renewables and that’s what will end up powering not just server farms, but lots of things. It’s a powerful position big data and the cloud hold in the energy marketplace. But then Facebook is patently not transparent about where its energy comes from, so it is not easy to assess how good or bad they are, or how they are trending. 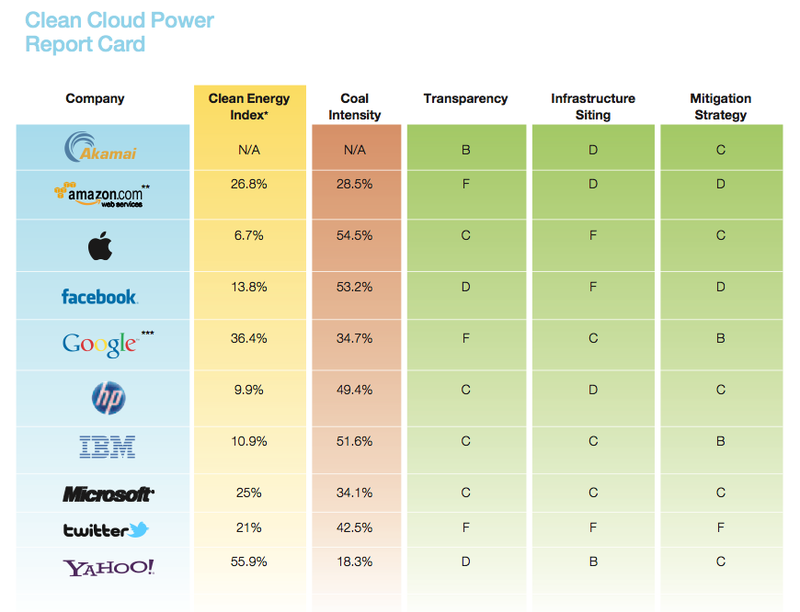 Indeed it is worth looking at Greenpeace’s Clean Cloud report card to see – just how dirty is your data? I’d love to see a session at the upcoming (or next year) Strata Big Data Conference on say “How to use Big Data to make Big Data more Green.” Maybe even a competition to that effect if there was some data that could be shared? Or maybe just a session where Greenpeace could present their research and engage the community. Just a thought. Big data has got some big responsibilities on its shoulders when it comes to the environment. It would be great to see them engage on it. This entry was posted in commentary, cool links, public policy, technology and tagged bigdata, data, facebook, green, greenpeace on July 29, 2011 by David Eaves. One factor of big data online appears to be mass duplication of files. Since we don’t see the data centres, we don’t think about how much we send or whether it exists elsewhere. I think that better file control could see massive savings on server space and consequently energy use. 1.5-2% of global electricity use? IIRC that was anti-Kyoto FUD coming from AGW deniers, then repeated by marketroids selling efficient servers. If you can find any credible primary source, I’d like to see it. As far as grading, Greenpeace is clearly ignoring Google’s work on green energy and transmission – how are they middle of the pack!? Hi Daniel – I don’t think Greenpeace has ignored Google’s work on green energy, they did give them a “B” on mitigation strategy – the highest mark on offer.